Hyundai is following its path towards connected autonomous vehicles with the introduction of intelligent personal cockpits for improved driver experience. Hyundai is demonstrating its Intelligent Personal Cockpit at the Geneva Motor Show. 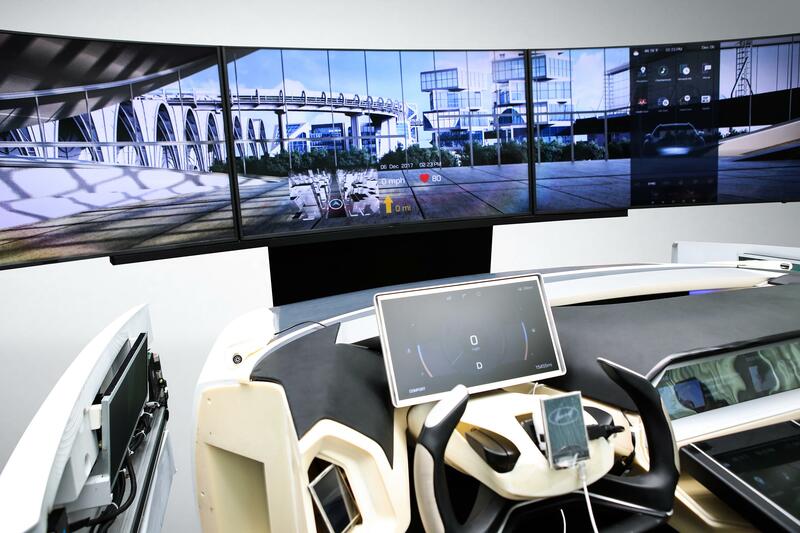 The cockpit shows the Company’s progress in connected car technology development and employs multiple cutting-edge technologies ranging from voice recognition Artificial Intelligence (AI), Internet of Things (IoT) technology and even driver stress detection. New voice-recognition technology from SoundHound allows drivers to voice-control frequently used in-vehicle functions such as air-conditioning, sunroofs and door locks. In the future, there will be an entire suite of new voice-control capabilities inside the Intelligent Personal Cockpit including Car-to-Home IoT capability. Car-to-Home IoT extends the reach of the driver’s voice beyond mobile applications and into the home environment. With voice commands, a driver can not only play music in the car, but also turn on the lights at home and stream that same song right to their home audio system for a seamless transition from driveway to living room. The Intelligent Personal Cockpit goes a step beyond most other voice recognition technology with the ‘multiple-command recognition’ function. The system recognises two separate commands of the driver in the same sentence and completes each task separately. The Intelligent Personal Cockpit can act as a proactive assistant system, predicting the driver’s needs and providing useful information. For example, the system may give an early reminder of an upcoming meeting and suggest departure times that take current traffic conditions into account. Another technology embedded in the Intelligent Personal Cockpit is Wellness Care. The function uses two sensors placed on the steering wheel and the seat. The sensors monitor heart rate for sudden changes and may detect driver stress level. Developed by Hyundai’s In-house start up called Tune!t, there are two additional advanced features as part of the IoT cockpit. “Smart Tuning Package” enables the cockpit to turn into a personalised space. The seat position can be adjusted to the driver’s height, and music is chosen to driver’s preference using wireless IoT technology. Another striking feature is that you can open the door of the vehicle simply by knocking twice. To develop the next generation of hyper-connected production vehicles, Hyundai is collaborating with IT networking specialist, Cisco. This automotive and IT collaboration is focused on technology for in-vehicle data demands, which will increase exponentially with autonomous driving and other connectivity needs. The flexible expansion of connections to handle large data sets coming from various components in the vehicle simultaneously is ensured through Ethernet-based software. Hyundai and Cisco have created a new platform that provides highly secure access to all the data in the vehicle. The platform utilises the first generation of 1Gps architectures and Automotive Ethernet with QoS allowing for maximised bandwidth. The system is highly configurable and secure – and offers the flexibility to design and build new services. It will also accelerate innovation, provide ‘over the air updates’, and shorten the lifecycle in bringing new capabilities to market. To bring self-driving Hyundai vehicles to market by 2021, the company recently entered into a strategic partnership with Aurora. The car maker will incorporate Aurora’s self-driving technology into Hyundai vehicles starting with models custom-developed and launched in test programmes and pilot cities. The new NEXO is the first model to be utilised in the test processes, which started in early 2018. The fuel-cell powertrain offers an ideal platform to implement autonomous driving technologies, which requires a massive amount of power to support the large amount of data communication as well as the operation of hardware such as sensors. Over the longer term, Hyundai and Aurora will work to commercialise self-driving vehicles worldwide. To start, the partnership will focus on the on-going development of hardware and software for automated and autonomous driving and the back-end data services required for Level 4 automation. Level 4 autonomous vehicles defined by SAE can operate without human input or oversight under select conditions. The goal of the partnership is to deploy autonomous driving quickly, broadly and safely.